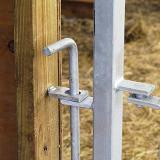 Linking stakes are stronger and more versatile than all other methods. All parts of Premier's handling system use stake and eye connections. Use to connect panels, orphan headgates and creep gates. 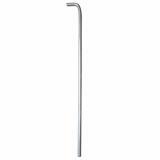 Also use with our handling equipment. Lag bolt connectors can also be used as a connection device. See Handling Equipment instructions above. 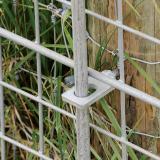 Used extensively on the Premier farms to securely connect gates and panels via linking stakes. Uniquely strong, fast and smooth design. Helps to make sorting a breeze. Hand-operated stop gate. We locate this gate at the rear of our narrow treatment chute. 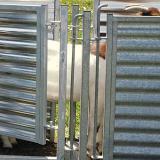 Solid corrugated sides block the animal's side vision and encourage sheep/goats to move forward on their own to the exit. Panels allow animals to be diverted through the side of the chute. Enables 3-way sorting with a single pass of a herd or flock through the chute. Gives lambs and goat kids "adult free" access to creep feed and allows guard dog puppies ability to come and go from sheep/goats and food. 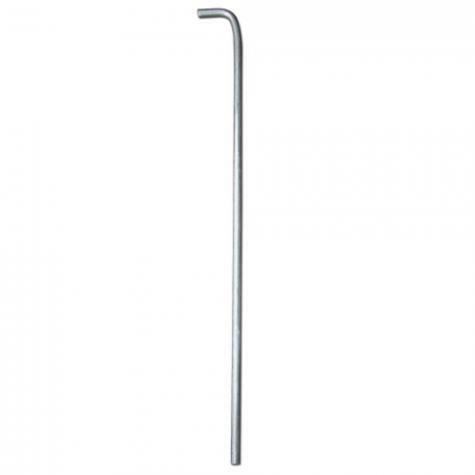 Very good product, I would like to see one that is smaller in diameter available.